It’s not often I find a Koegel product I haven’t seen before. Having grown up trying all the products they make it’s probably been a good 25 years since doing a double-take in a grocery store when spotting an unfamiliar Koegel item. But that’s exactly what happened yesterday when I spotted these “chubs” of Koegel’s Chili Topping. Now let’s be clear: These chubs do not contain the famed Flint Coney Sauce. 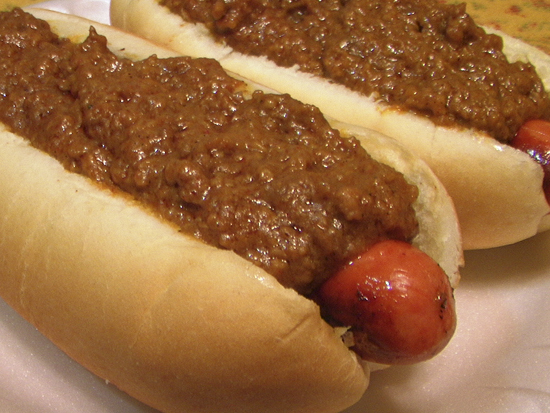 Their own Hot Dog Chili Sauce is sold to restaurants in a 6 lb tube in the Detroit area and contains beef heart. The actual Flint Coney Sauce is made by Abbott’s Meats and is distributed by Koegel’s in a 10 lb tube. I cooked up the contents of both chubs and grilled up the Viennas in a little olive oil like I normally do. After photographing these two, I added a bit of mustard and consumed them with a bit of “Happy Feet”. I then had to have a third dog, minus the mustard, to really get my teeth into what I was tasting. I always said if I reveiewed something and didn’t like it I’d be honest and say so. 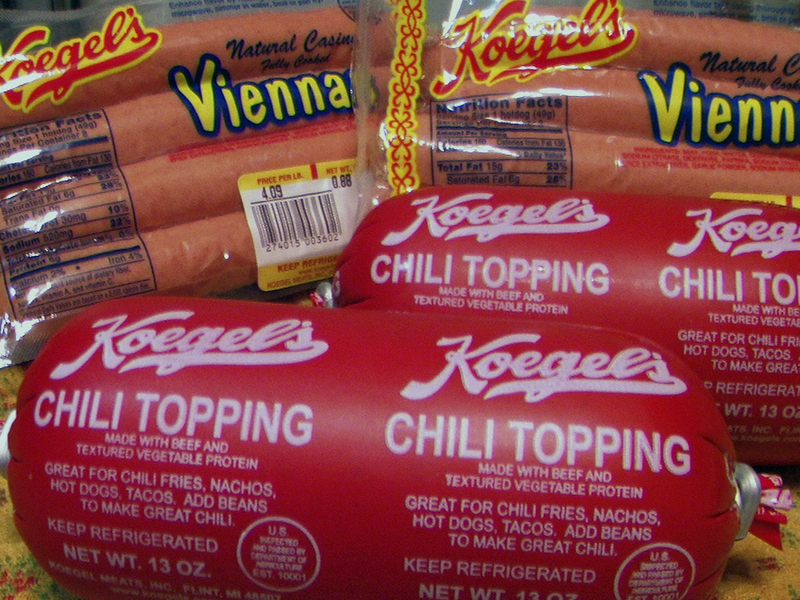 The fact is, Koegel’s Chili Topping is the first Koegel product that really does nothing for me. Sure, it has a nice body to it and a good, solid meaty flavor. But to be blunt it’s really rather non-descript. In a store, if I saw this side-by-side with the National Coney Island Hot Dog Chili Sauce I’d purchase the National Coney version over the Koegel’s. I think the “textured vegetable protein” may have a lot to do with the flavor. That alone on the ingredients list would keep me from even trying it. Nothing we would even think of eating. On the other hand, if it was mainly tofu w/roasted veggies …. sure! Everyone should eat much more vegs. So, grillin the franks w/olive oil? Okay. Never thought of that. Restaurants often use lard w/beef fat when toasting the bread/bun. Not good health-wise. Koegels is a Detroit fav and living in S Florida now, I get the urge for a real Detroit style Coney dog. I like Lafayette and National a little better because they up the spice factor. The Koegels is a little more bland than the others.if you really want to liven it up, add a bit of mustard powder and chili powder to the contents of the chub when reheating it.it makes a huge difference.